When I was 20 years old, armed with a zoology degree, I had a dream job in mind. It was to spend my days flying a microlight at a few hundred feet tracking lions across the plains of Africa. 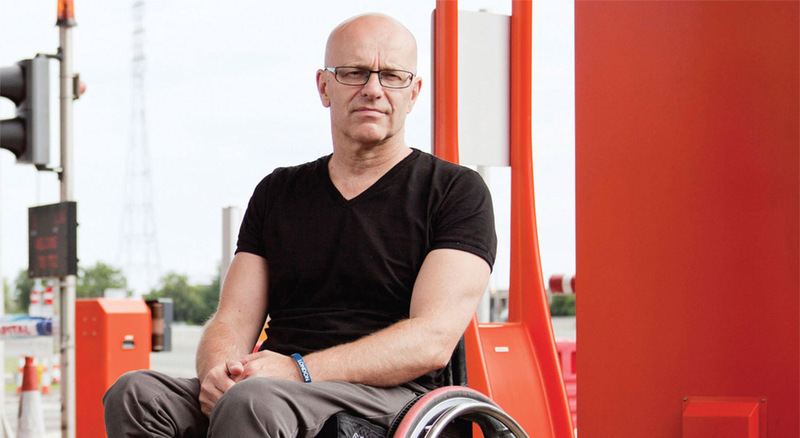 At 21, a life changing spinal injury forced me to rethink my career options. I have always had a tremendous work ethic, and wanted to get a great job that would satisfy me. I did what anyone would do and set about using my degree to get into a graduate entry level job. What I didn’t foresee, however, was the difficulty in even getting an interview. I soon found out that if I disclosed my paraplegia I got ignored or a straight refusal, yet if I didn’t I would regularly get an interview. As soon as it became apparent I was a wheelchair user the interviews were cancelled, often on the grounds of inaccessibility. I tried using my science background, applying for numerous jobs (one of my options in my first year university was microbiology, another was chemistry) and I managed to secure one interview for a lab technician post. They only wanted A- levels and I had a degree; I passed with flying colours and was offered the job! I was so shocked, I wet myself. Fortunately for me and unbeknown to my interviewers, my incontinence sheath and drainage system kept it all in! Unfortunately for me, the offer was retracted 10 minutes later because they said I would have to go in a minibus to college for day release and the bus wasn’t accessible, “Sorry”, they said. When I pointed out that I had driven to the interview in my own car, this seemed to make no odds. On one occasion, I was so desperate to find work that I put on my callipers, used my crutches and climbed 4 flights of stairs (there was no lift) to get to an interview to become a sales rep for an insurance company on commission only. Unfortunately, once again, no luck. Although I was still me and I had a degree, the fact that I was using a wheelchair made potential employers view me as an undesirable candidate. I was hopping mad (well, not hopping, but you know what I mean). There were no legal disability rights back in 1984 so I decided to use my life experience to change the world. I looked for a job where the employer actually wanted to make changes for disabled people. I became one of the first local authority Access Officers in the country responsible for access to the built environment and writing policy for all council departments. At the interview, it became apparent that senior officers didn’t really know what the job description was. So, right there and then, I wrote one for them and they gave me the job on the spot. To be objective, I got that job because I was a wheelchair user. Within three years I had made such a success of the post that I was poached away by a government agency to implement an accessibility strategy across four local authorities and 26 miles of riverbank regeneration. In the early days, I found that I had to be twice as good as a nondisabled professional to get noticed. I do recall one occasion speaking to a client during a conference break who said “Oh, you’re David Burdus, great report you submitted, I never would have guessed you were in a wheelchair”. Accessibility was a bit of an issue. Many buildings were still stepped access, had no lifts and no wheelchair accessible toilets. I had to do much of my travelling around the country by being lifted manually into the guards van on trains which were often notoriously cold and of course had no sanitary facilities. I then made the decision to turn to private practice where I was finally able to bring some of my passions into my job — it’s fantastic. By setting up my own PR Company I’ve been able to work the way I want, and my disability doesn’t have any impact on my work life. I have worked on projects with The Diana Princess of Wales Memorial Fountain, the Palace of Westminster and worked with government ministers and departments to promote accessibility. Even with all of this, I had time to create the fastest wheelchair race on the planet: The Tyne Tunnel 2K International. Paralympic athletes from all over the world participate — some reaching top speeds of 50 miles an hour. I was even called in by the Minister for disabled people in the run-up to the introduction of the Disability Discrimination Act back in the early 1990s to advise on inclusive policies. Working, travelling and report writing at my desk have taken its toll over the years: my scoliosis is much more progressed than it would have been. I’ve had a few issues from sitting too long on my bottom, and travelling for long periods without toilets (which still happens on trains and aeroplanes) can play havoc with the old bladder and associated infections! That said, I’ve had a great 33 year full-time career as a spinal injured person — I’ve had some great highs. I even managed to realise part of my dream job when I negotiated a commission that involved flying in a powered hang-glider over the coastline of Northumberland (didn’t spot any big cats though).